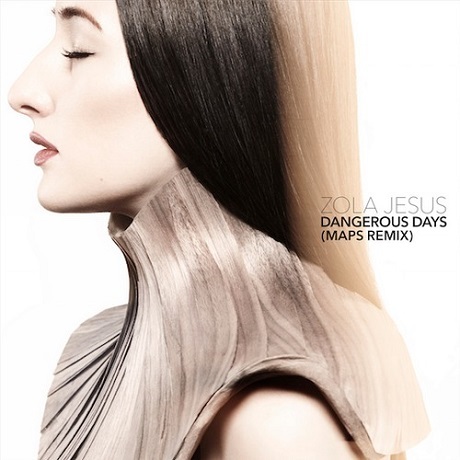 Zola Jesus is offering up another track to help support her upcoming Taiga LP, this time letting MAPS (a.k.a. electronic artist James Chapman) take the reins with a remix of her recently premiered "Dangerous Days" single. In many ways, the revamp stays true to the original's airy but danceable vibe, letting the sky bound synth work do a lot of the heavy lifting. The beat is still groove-centric, but perhaps plays a little more straightforward than the single proper's penetrating bass drum gallop. Likewise, the remix favours a minimalist approach to vocals, keeping things trim with a couple choice selections. While you can check out the remix of the synth-pop single down below, Zola Jesus' Taiga arrives in stores October 7 through Mute.